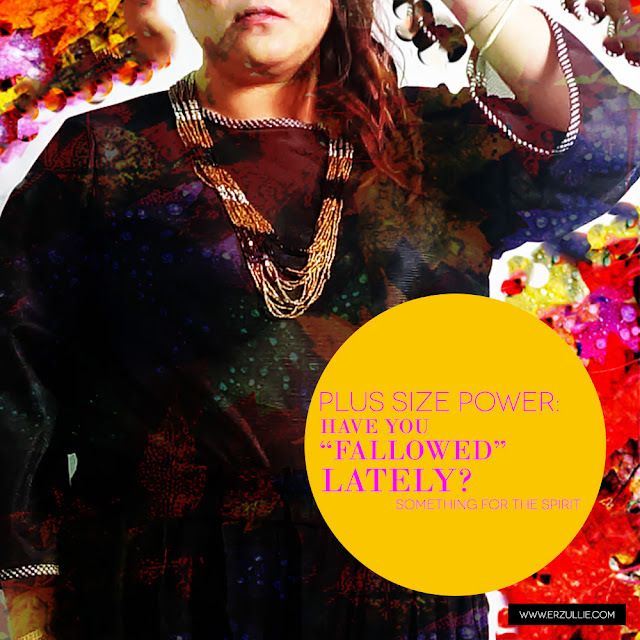 Erzullie Fierce Plus Size Fashion Philippines: PLUS SIZE POWER: HAVE YOU "FALLOWED" LATELY? PLUS SIZE POWER: HAVE YOU "FALLOWED" LATELY? "Fallow". Have you heard that term? I actually bumped into it when I was looking at inspirational decks and there was a term there "time to fallow". I actually thought that it was a typo for "follow". I googled it and apparently it's a farming term. It means being "plowed and harrowed but left unsown for a period in order to restore its fertility as part of crop rotation...". This struck a chord in my spirit as an Erzulliesta because I am always on the move. I like it that way. I love working. I love creating. I love that I am always active. I have even been called a "shark" because I always have to move --- or I die. Downside to that facet of mine? When I am in a state of rest or I have worked "too fast and too furious", I finish too early and now --- I HAVE NOTHING TO DO --- I get scared and feel down. I feel like I am a bum (in a bad way) and my worth goes down. This stems from my upbringing too. I grew up in a household that highly values productiveness. If you are caught resting for a period of time, you are labeled as "lazy" and immediately looked down upon. Of course, there are good and bad sides to everything and I am just realizing it now. I grew up being productive and responsible (as much as I would like to think so - ha! ), but it also brought a lot of shame if I am not doing anything at all. Hence, back to the term "fallow". My fellow Erzulliestas know this. I have a problem with the term "rest". There are times that I am having dinner with the girls and they just have to stop me for fidgeting with my phone because of orders and inquiries. I can actually see my friend, Z, saying, "Aries --- are you working?" and I slowly put my phone away like a child being caught with her hand in the cookie jar before dinner. Recently, this October, my work flow has changed. And if there is one thing that we know about life, it is the fact that it is about change and we just have to ride its flow. Everything seems to be so relaxed right now. I know in my heart that this is my moment to "fallow". I have "harrowed and plowed" my life and now it's about letting my life breathe for a moment to restore itself to its full form. "REST, ARIES. REST. FOR GOODNESS SAKE. REST." Or --- just. plain. stop. How can being "inactive" be part of empowerment? Next, I feel like my life, which I love to direct, design and just plain fuzz about all the time is now being given to something out there and I have no control over it. How can this be empowering? I feel so vulnerable. I feel too open. What if something hurts me out there as I let my life open? I feel so uneasy. I am literally thinking of that open field, all "harrowed and plowed" --- what if a comet comes down on it and devastates everything? "I'm too open. I can't have this!" --- these are my screaming thoughts. But when I saw that inspirational card, I have realized that being open and resting while being open is actually part of empowerment. Why? Because being open and resting to rejuvinate yourself is actually relaxing. Relaxing means releasing tension and stress from your life and body. Doing so is an actual act of self-love. With that in mind, while you rest, you actually generate self-love. You are manifesting something, even while you are resting. And being open and vulnerable? It's needed to release tension that you have received from all that activity. You need it to become more fertile in the future! So, note to the "sharks" like me. It's time to think like you are a field. Resting and being open to breathe and relax is safe and it is needed to love yourself, which in turn --- empowers you more.